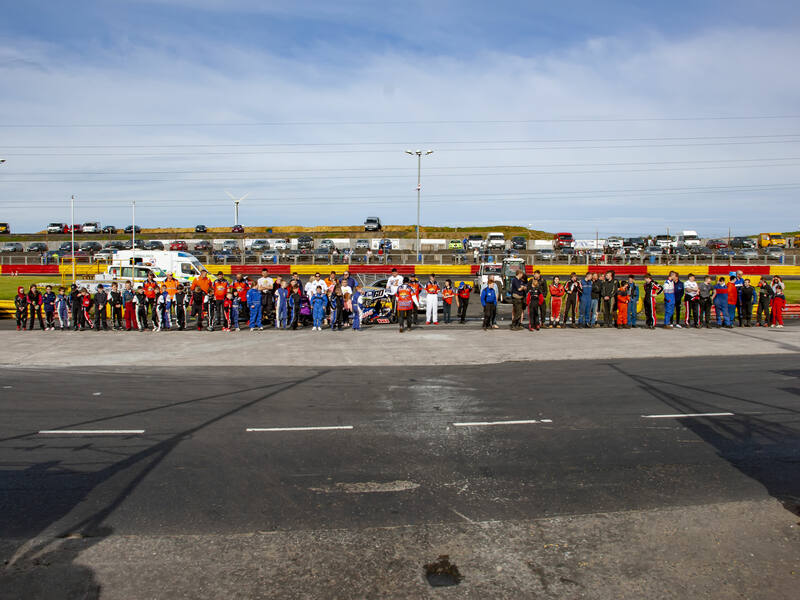 A beautiful summer's evening greeted drivers, teams and fans as they gathered at HRP Lochgelly Raceway this past Saturday to pay tribute to a much-missed member of the oval racing family at the 2018 Keir Millar Memorial Meeting. 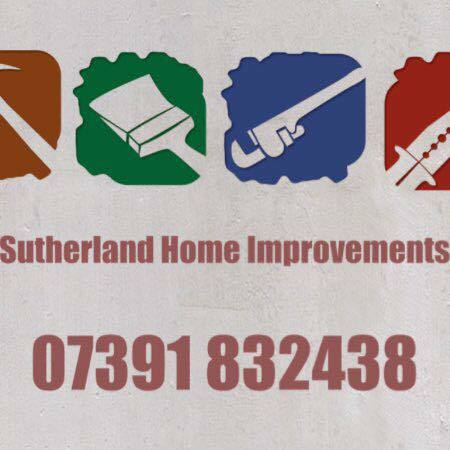 Keir began his racing career at HRP Lochgelly raceway in the Ninja Karts where he achieved great success. Keir became the first ever Scottish World Cup Champion and he was one of the pioneers of the formula that has blossomed into the best proving ground on the short ovals for young drivers. After graduating from the Ninjas, Keir moved on to Ministox and looked like continuing his successful ways, having already picked up numerous wins, before that tragic night just over three years ago. Prior to the first race, members of Keir's family and friends were joined by fellow drivers, mechanics and staff in leading a minutes' applause in memory of the young man known as Speedy Keir. The first race of the night was something a little different as the Jus Bounce Young Guns Series got underway in the Ministox. The Series is open to drivers who have been in the lower grades at any point during the current season and it was won by a rapid Ryan Borthwick from the yellow grade ahead of the now blue-graded Barry Scott and red-graded Scott Allardyce. 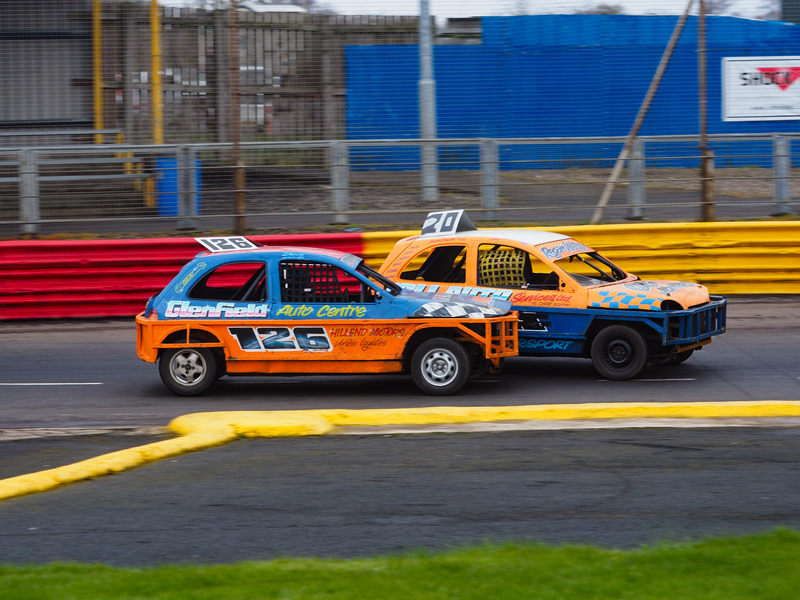 The event saw the Ministox contesting the HRP Lochgelly Round of the Keir Millar Memorial Series and this attracted one English visitor in the shape of British Champion Charlie Santry. Kai Gilmour and Max Walker battled over the lead in the early stages of the race. Mitchell Gold took up the running; but a red-top train led by Santry was slicing its way through the field. Gold put up a fight; but Santry and Danny Whyte were able to overcome Gold's stubborn resistance to claim first and second respectively while Gold held on for third. The second heat saw a great battle among the red tops who battled each other as they came through the field. Santry looked quicker than any other car on track and underlined that as he took the win from Michael Mitchell and National Points Champion Sean Naismith. 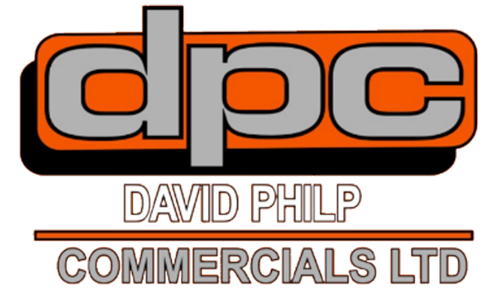 The Feature Final was a fantastic race run under the HRP floodlights with the Ministox, once again, putting on an exhibition of racing. The red tops made their way to the front of the pack in short order this time round and Santry was able to take a faultless hat-trick as he bested Ciaran Adams and Scott Allardyce in the last race of the night for the Ministox. The Ninja Karts were naturally on show at a meeting paying tribute to a former Ninja Kart World Champion. Around thirty karts were in the pits in one of the busiest events of the season so far - and that was with no visiting drivers! It was great to see Jake Wilson make his return to the formula while Dean Heeps made his Ninja debut. The first race of the night for the Ninja Karts was their traditional whites and yellows heat which was won in dominant fashion by Kaden Connor from William Plenderleith and Kaitlyn Smart. The first heat proper saw two thirds of the whites and yellows joined on track by the higher graded blues and reds. William Plenderleith and Kaitlyn Smart led for the majority of the first half of the race before a flying Demi Ritchie took over and it looked like Demi may hold on to take the win until current World Cup, Scottish and National Points Champion Charlie Hardie arrived on the scene and took the chequered flag ahead of Ritchie and European, British and English Champion Robbie Armit. The second heat was led by William Plenderleith before Kaden Connor briefly took over before losing numerous places in an incident; Charlie Hardie came through the chaos to head the field and cross the line to take his second win of the night from Armit and Open Scottish Champion Bailey Millar. The third and final heat saw Hardie going for the hat-trick and it was led by Hamish Plenderleith before Connor took over at the sharp end once more. Connor held firm in first spot for a number of laps before the flying duo of Hardie and Armit caught and passed the Shotts youngster. Hardie stayed ahead of Armit, but not by too much, to take his third win of the night as he bounced back to form after a few weeks of sub-par performances by his usual high standards. The Superstox were also back in action seven days after some of the drivers headed south to Ipswich to race in the British Championship. Sadly, the Scots were not able to bring home the silverware as Jason Cooper scooped another title, but it was straight back to domestic business for Scotland's top open-wheel stock car class. The first heat saw lone white top Jordan Black make most of the running before a very quick-looking Scottish Champion Bryan Forrest took his new for 2018 KMR car to victory lane with Black taking second and National Points Champion David Frame coming home in third in his newly re-panelled car which boasted a new colour scheme. Black made the running again in the opening laps of heat two before being overhauled by Mark Brady; but it was the flying duo of Forrest and Frame who were catching the eye as they came through the field with Frame seeming to have the edge this time as he passed Black and then Brady to take the win. The feature final started with Black in the lead but all eyes were on the heat-winning pair of Frame and Forrest who were already on the move and it was Forrest who hit the front first and looked to be on course for a heat and final double but, as Forrest's car appeared to lose its edge, Frame closed in and pushed the Scottish Champion wide to take the final and his second win of the night to enhance his defence of the National Points championship. The National Micro Bangers arrived in good numbers with drivers from the north of England joining the more local drivers for some metal-mashing mayhem. The usual chaos ensued immediately with one car rolling over on the start line of lap one! Once the race got back underway, it was Joe Ewart who took the win ahead of James Dillon Jnr and Brandon Womersley (Keir Millar's older brother). The second heat saw most of the cars make it back out and it was Jason Todd who took the win in a race with only four finishers! Ewart won the sprint final before a titanic Demolition Derby saw Craig Royal take the win in an event punctuated by some huge hits to bring a close to the 2018 Keir Millar Memorial Meeting. 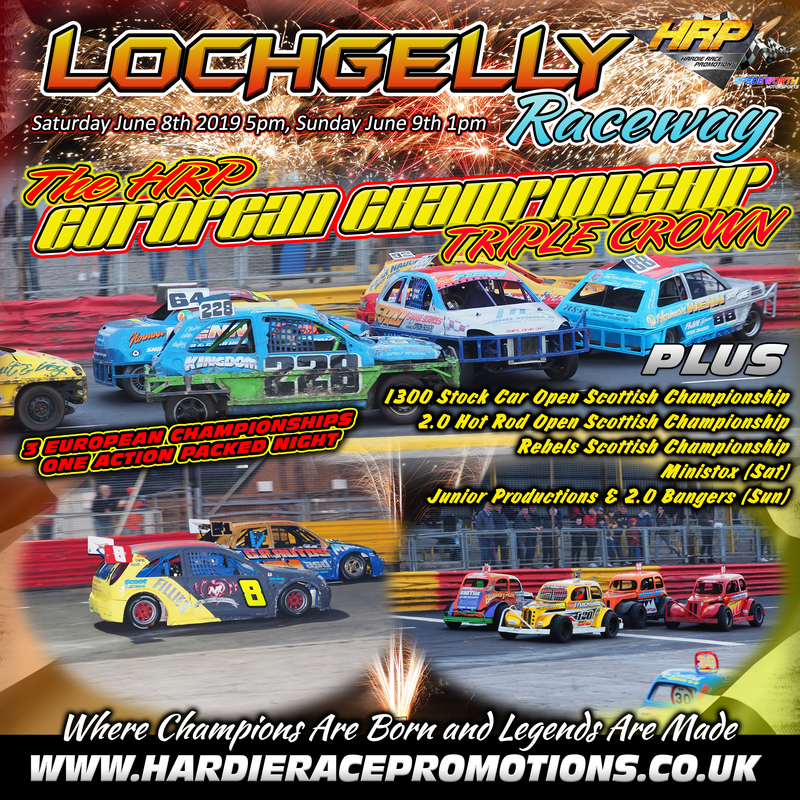 The next slice of stock car action at HRP Lochgelly Raceway comes your way this Saturday May 19th and features Superstox, Stock Rods, Ministox, ProStocks and Junior Productions in a busy five-formula programme of events starting from 5:30pm at Scotland's premier stock car racing venue - HRP Lochgelly Raceway!